Brighton & Hove Albion goalkeeper Mathew Ryan. Picture courtesy of Getty Images. Mathew Ryan is hoping to give Brighton & Hove Albion's supporters memories to 'cherish for the rest of their life' after they reached the semi-finals of the FA Cup for the first time since 1983. Albion's penalty shoot-out victory over Millwall in the quarter-finals last Sunday saw the Seagulls reach the final four of the cup for the first time in 36 years, and they will now take on Premier League champions Manchester City. Brighton's run in the FA Cup in 1983 saw them defeat Sheffield Wednesday 2-1 in the semis before facing off against Manchester United in the showpiece final at Wembley. The final finished 2-2, thanks to an 87th minute goal from Albion defender Gary Stevens, forcing the tie to be replayed. The Red Devils' class showed in the rematch as they ran out comfortable 4-0 winners to take the trophy home. 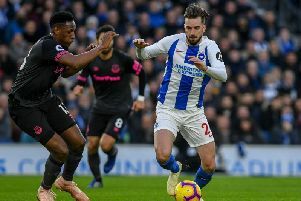 Ahead of their semi-final date with City on April 6 (5:30pm kick-off), Ryan was well aware of the meaning the cup run had to the club, and he is proud to represent the city of Brighton as they look to create history. The Australian keeper said: "Someone just mentioned to me the last time we were in a semi-final the players were flown up by helicopters to the game and all these sorts of things. "It just reiterates how important a final or a semi-final is in this competition. "We know how important it is and we've heard of the success in the past and if we can add to it it's going to be another memorable evening and something that everyone who is a part of the club will cherish for the rest of their life. "As a town and a city for where Brighton are now from where they've come from, it's great just to be representing the area. "I think we've made everyone proud and come the semi-final it'll give us another opportunity to do it again. "I'm proud to be representing our club, our fans, and where the club has come from in the past with the dark days and the struggles that they had. "Now we're consistently fighting in the Premier League and a semi-final in the FA Cup is something that we can all be proud of." The world's oldest cup competition holds a special place in the heart of the Seagulls stopper. Ryan revealed that as a child growing up in Australia he would watch FA Cup finals in the early hours of the morning. He said: "When you talk about historic competitions and games, the FA Cup definitely comes to mind. "I remember being a young kid getting up and watching Liverpool win FA Cups so it's an occasion I'm very much looking forward to. I'm going to embrace it. "I guess one bad thing about being an Australian is that European games are on in the morning. "It wasn't every time. I valued my sleep. "I had to get ready for school quite often but on a special occasion like a FA Cup final or the Champions League knock-out stages I managed to get up in the morning to watch. "Millwall was my first FA Cup game so it's definitely going to be a memorable one. "I'm sure the second one is going to be just as memorable and I'm looking forward to the occasion."